Top restauranteur believes launch of The Botany will spark a flood of openings in North Glasgow. Alan Tomkins, one of Glasgow’s leading hospitality entrepreneurs, has chosen Maryhill as the location for his latest venture, The Botany. The man behind a whole host of the city’s best-loved institutions, including Urban Bar & Brasserie, Vroni’s Wine Bar and Blue Dog, will open the Maryhill Road venue on Wednesday 12th September, alongside business partner Calum Lawson, who’ll be the owner on site. The new bar and restaurant born from its previous incarnation, The Strathmore, which opened in 1877, will cater to Glaswegians on the hunt for the very best food and drink in a beautiful glasshouse setting, free from the pretence of fine dining. The name pays homage to the tale of prisoners starting their journey to Botany Bay on the nearby Forth and Clyde Canal. Alan, a former board director of the Glasgow City Marketing Bureau, believes this move could encourage more bars and restaurants to think outside the box and break free from the shackles of the West End. This is a very exciting time for Glasgow. Having worked in hospitality for as long as I can remember, I’ve seen the city change and develop its attitudes towards food and drink. Options used to be very limited. Now, Glasgow’s a haven for foodies. The menu’s inspired by cuisines across the globe, while the look and feel of The Botany, which is just a stone’s throw from the Maryhill locks, elicits comparison to restaurants on the canals of Amsterdam. Chef John Paul Lappin’s CV is a feast for the eyes with experience in some of Glasgow’s top restaurants, including Gamba and Urban Bar & Brasserie. The menu will deliver comfort food at a high level using locally-sourced ingredients. Highlights include a venison loin smoked in-house and a Sri-Lankan-style monkfish curry. There will also be brunch specials served on Sundays, a multitude of botanical cocktails, extensive wine list, rotating bottle selection, quality gins and whisky. Last month at 85 South Bridge, Edinburgh - Mono restaurant opened, focussing on creating a complete experience. In doing so, the restaurant aim to highlight the relationship between raw nature, the ingredients and their cultural history. The research lab is directed by Michelin star experienced Chef Zielinski, alongside Italian foodie Joseph Crolla and his sensational team. You can expect to encounter a multi-sensory experience; visual, textual, sound, and all kinds of stimuli, as well as a good dose of contemporary classic synthesis on what they love most: Food. Simplistic and natural interiors, complementing the effortless and fresh cuisine that follows the roots of culinary principles in Italy: excellent quality ingredients, honest cooking and the belief that food is culture. The Grand Cafe at the Scotsman Hotel opens tomorrow, and you can read the review on our website. Our review of the Grand Cafe at the Scotsman Hotel, Edinburgh is now live on the website here. As a wee bit of fun you'll find fourteen newspaper titles in the article, let us know in the coments if you find them all...! Check out our latest review - Boardwalk, Falkirk - now up on the website. Our review of Boardwalk in Falkirk is now up in the Central Scotland section of the website, or by clicking here. Our latest review, of the Grosvenor Casino Riverboat in Glasgow is now on the website. I don't really like surprises. I like a predictable, almost mundane life, where I know exactly what to expect. So imagine my surprise when an email hit the hello@scottishfoodreview.com inbox from McDonald's. Here we are, constantly espousing local sourcing, quality ingredients and individuality and possibly the most well-known multinational fast food restaurant chain is inviting me to try and make their ubiquitous Big Mac. First of all I checked they had sent the email to the right person, just in case! When the big day arrived I was greeted by the franchisee (Bob!) and his loyal and friendly team. It was half one and the lunchtime rush was in full swing as families, solo business-folk, workies in vans and the slightly dazed looking folk that looked like they'd just got off a long haul flight (which they might have now I come to think about it) all looking to get a quick meal. It was interesting to see how in this restaurant they were reinventing the McDonald's concept, keeping the best bits whilst removing the annoyances. Now there is no queueing at a counter to order and watch the staff select a prepared burger from the shelf, no it's all made to order. Your choices now are myriad. You can use one of the kiosks, giant touch screens in a range of languages, that allow you to select your meals and make whatever personalisation you wish, don’t like pesky pickles, hold the tomato, you betcha. You can use the mobile phone app to get your order ready and scan the QR code at the door to let the kitchen know you've arrived and they'll get cracking. You can also sit at the table and order from there on the app. Not all of these features will be available at all the restaurants yet, but this is the way of the future, so if your local McDonald's doesn't do this yet, it will soon! Until then (and even in the new restaurants you get the option if you want to do it the old fashioned way) you can still head to the counter and order from one of the friendly staff. Then you can wait for your meal to be handed to you, like the old days, or better still to your seat. The restaurant is split into zones which you use when you order and the food is served at the table. Imagine when you are trying to corral a heap of children, remember orders, juggle straws, well no more. Place the little cherubs in front of one of the tablets, place the order from the comfort of your chair and wait. The server will take care of everything bringing condiments, napkins the whole kit and caboodle over to you. To quote one of the McDonald's team “if you have to get up from your seat we'd see that as a fail.” To me, as far as front of house service goes, in what is still a value orientated market, that's a winner. I can pay nearly twenty quid for a burger in some places and still have to stand in a queue, so digitally enabled full on table service for a 99p cheeseburger is definitely a surprise. There were more surprises lying ahead, for as we crossed the threshold, through the ‘staff only’ emblazoned door and entered uncharted territory, there was a table with hats and aprons and a personalised name badge waiting for us! Whilst we were preparing ourselves for the trip to the kitchen, lots of hair net kerfuffling took place, I appreciated the neat and tidy staff (crew) room, the iron (so the staff can look their best) and best of all the dozens of photos of the team on a range of nights out, team building and fun days that gave the impression that looking after their staff was high up on management's priorities. Once suitably attired we scrubbed up, passed food hygiene inspection and were let loose into the kitchen proper. Two things were immediately apparent. Firstly it was very clean. This is a kitchen at the end of the lunch rush, I'm expecting a certain degree of carnage, maybe not a pile of dirty pots and pans, but some sign that a couple of hundred people have just passed through, but no, everything appeared to be pristine. Which leads us onto the second observation, it was very methodical. A place for everything and everything in its place, there was some very clever process planning in place, that produced optimum efficiency, so we get tasty burgers quickly. It's the little details like the bespoke toaster that can grill the top, bottom and both sides of the middle of a Big Mac bun at the same time. Bet you'd never given it a second thought before, but there is a special bit of kit to do just that task. The double sided hot plates cook the burgers for just the right time and they have an illustration to remind you that the order you put the patties on is the order you need to take them off, so they are all on the heat for the same amount of time. And when you cook a burger at home and you do that thing with the spatula to push the meat down, yup these have an automatic function to push down and release when cooking, just to add a little tenderness… The patty is pure beef, 100%, from British and Irish cows. Yes, its flank and forequarter, but it's being minced and shaped into a tasty burger, not served on a plate with a Diane sauce so that shouldn't worry you. Once cooked a no doubt carefully calibrated grind of salt and pepper is added and the burgers placed into hot storage. Because no fully prepared burgers are sitting waiting, everything is prepared to order, so this may take a little longer than simply handing you a lukewarm one that was prepared earlier. But, you know what, I'll wait thirty seconds longer for the freshness of a bespoke burger, thank you very much, and McDonald's believe that I'm not the only one. The patties may be grilled and kept hot, but when that order for a Big Mac hits the screens, (there's no shouting, not bits of paper, just a monitor detailing the personalised order), that's when the magic happens, and not a second before. A bun is toasted, onion, lettuce,two skooshes of special sauce, cheese, pickles added in just the correct quantities, before the meat is added, the two halves joined and voila your freshly made burger appears. And then it was my turn… After observing a slick professional turn one out in twenty seconds I had to bring my A game, and I'd like to think I didn't let myself down too badly. I managed to toast the right side of the bun, but then skimped too much on the lettuce and doubled up on the pickles. When I turned it over and opened the box there was a vaguely Big Mac-esque creation inside. Admittedly it also took three times as long as my McDonald's Yoda to demonstrate the correct technique, but not a bad first try I thought, certainly tasted pretty darn good to me! Looks like I made the world's smallest Big Mac! It really was full-size, honest! And with that I was shown back out of the kitchen and into the by now slightly quieter restaurant. I polished off my handy work and thought about what had just happened and reconciled it with my initial thoughts. First off the old adage of “you get what you pay for” remains true enough. For the price of even the most expensive McDonald’s Signature meal, you wouldn't realistically expect hand ground wagyu in an artisan brioche bun, liberally dusted with unicorn tears, so guess what, you don't get that. What you do get is a freshly prepared, pure beef burger. If anything it makes the price of some of the ‘gourmet’ burger establishments look frankly ridiculous. Table service, easy ways to order freshly made food at a family friendly price, what's not to like? Brave, not really. Daft, definitely not. Supremely confident, I guess so. Guess McDonald’s is perfect for me then. Hotel bars and restaurants were for a long time somewhere to avoid, unless you were staying in the actual hotel, of course. There were a few notable exceptions, always at the rosetted and starred end of the culinary scale, but generally the hotel restaurant was the domain of the table-for-one business person and the octogenarian coach holiday party, unless it was a Sunday lunchtime when the place would be stowed. But times change, hotels recognise the benefits of livening up their food offerings and being genuinely attractive to folk who want a meal rather than a bed. The result is exciting new places to visit, and unsurprisingly Malmaison, the iconic and innovative boutique hotel brand, is keen to show off their brand spanking new Chez Mal Brasserie at Malmaison Glasgow. There is plenty going on at this end of the town at the moment so Chez Mal is going to need to be pretty special to pull in the punters. We secured an invite to the launch party to have a good look at what Malmaison hope will achieve just that. First impressions are good, just about the right amount of understated opulence from the outside, but a big chunk of fun inside with colourful balloons and the name spelled out in three foot high light up letters. There was a host of food on offer, from uber-posh scallops on tiny black pudding cushions, to beef sliders and pigs-in-blanket hot dogs demonstrating the quirkier side of the kitchens outputs. Chez Mal offers a fresh mix of contemporary styled dishes in the relaxed but vibrant setting. Food and drink lovers can look forward to mouth-watering menus, bursting with bold flavours and fresh ingredients, all complemented with craft beers, Champagnes and expertly crafted Mal cocktails. The decor shouts about Glasgow’s ship-building heritage and the wooden parquet flooring and glittering domed ceilings emphasises a laid-back luxury. Mal Bar brings you cold beers, crisp bubbly and a creative array of inventive cocktails, all in a cool and colourful setting with an electric atmosphere. Pull up a blue pew amongst the pop art and peruse the majestic menu of wines, ales, cocktails and spirits. Watch mixologists work their magic alongside the beats of the resident DJ on Friday nights. The inside out feel of the atrium, the neons and the big red pipework all add to a fun and funky feeling that is just that bit more relaxed than you’d expect from an upmarket hotel bar. The perfect venue for a pre-theatre Prosecco? You bet it is! They will be offering £5 cocktails and great music Wednesday – Friday, so you don’t need to wait for the weekend. Set behind the Mal Bar are three private dining rooms, which share the intimate atmosphere and are the perfect setting for a family get-together, a meal with friends or a celebration without any interruptions. Chez Mal looks amazing, the staff were lovely and the food and drinks we tried were excellent. This is not simply a hotel restaurant, Chez Mal is a destination in it’s own right, and if this evening was anything to go by, it’s going to be very successful! A La Carte - British ingredients with balance and panache. Beautifully-balanced flair dishes and perfectly seared steaks. Sunday Brunch - £19.95 - Experience the ultimate Sunday lunch at Malmaison with our endless Chef’s Table, your choice of superb main courses including traditional roasts. This November sees a new addition to the Edinburgh restaurant market as the team behind Chop House Bar & Butchery launch their latest venture in Edinburgh’s Old Town. 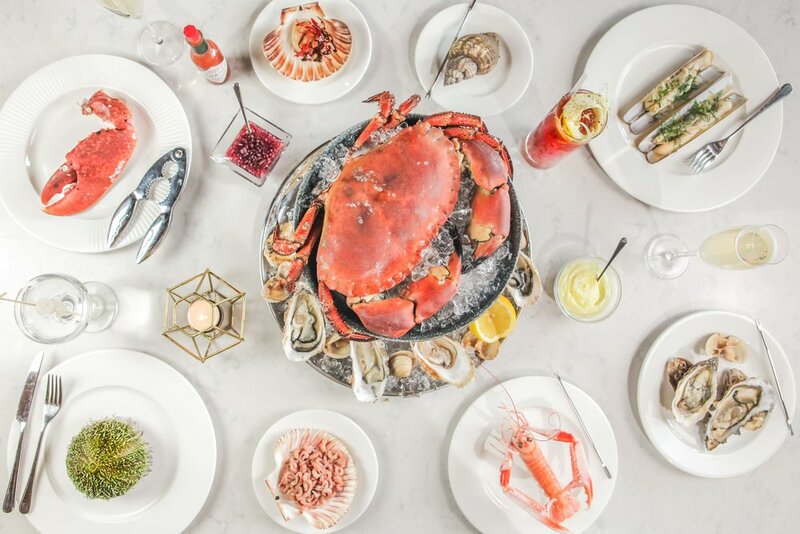 White Horse Oyster & Seafood Bar will open seven days a week on the site of the oldest inn on the Royal Mile, offering a dining experience focused on fresh seafood and shellfish. Boasting a custom-designed lobster tank, this new restaurant is committed to placing the highest quality seafood at the core of the business. A key feature of the restaurant will be its large custom-made lobster tank, presenting diners with the opportunity to select fresh Scottish lobster at varying weights. The spectacular tank promises to be an impressive feature of the venue’s interior. Sharing platters of shellfish including lobsters, scallops and crab will form a key part of the offering and a range of oysters from across the UK will be available, shucked on the bar in full view of the customers. The menu is designed to showcase the best of British shellfish and seafood in a collection of dishes to be shared by the whole table. Seafood platters and small plates allow tables to feast on a wide range of seafood. In addition, a selection of stand-alone dishes like monkfish curry, lobster and fries and whole lemon sole will be available. The complete refurbishment of the building on Edinburgh’s historic Royal Mile will create an intimate dining room, with additional covers housed in luxurious booth seating looking onto the lobster tank and further seating available within the bar area. The interiors will feature a rich heritage colourway with a number of notable design features, such as the custom-made green marble bar top where customers will be able to enjoy fresh oysters and cocktails alongside an all-day menu of small dishes such as crab fries and sesame tuna. As well as a carefully-crafted menu, White Horse has an unrivalled drinks offering including a bespoke cocktail menu drawing on classic influences. The list will incorporate seasonal ingredients, boutique spirits and seaside influences into a fresh and vibrant range of signature cocktail serves. White Horse Oyster & Seafood Bar will be supplied by a selection of boutique and smaller suppliers including Edinburgh-based Welch Fishmongers, Mara Seaweed & Cornish sustainable fishing specialists Wild Harbour. White Horse Oyster & Seafood Bar will open 7 days a week for lunch and dinner, with the bar trading until late. Edinburgh’s newest food, drink and entertainment venue will open in July 2017. Brewhemia is a ground breaking new venture from Castle Leisure Group (CLG) which sees an investment of £2 million into the iconic Scotsman Building basement. The venue poses a paradigm shift in food, drinks and entertainment where everyone can revel in the wonder of Brewhemia. With two years of planning and development laying the foundations it will be a unique and unforgettable experience. CLG have traded the Market Street site successfully for the last 13 years but felt it was time to introduce a brand new, innovative offering into the booming food and drink scene in Edinburgh. Previously a site for the company’s award winning Sportsters Bar & Diner and City Nightclub twin scene, the venue takes in some 29,000 sq feet and presented the perfect opportunity for a brand overhaul whilst being part of the rejuvenation of Market Street and the Old Town. Working with a clear vision of what they wanted to achieve CLG have partnered with a team of designers and fabricators to create a truly unique brand for Brewhemia, a fresh, new-look venue to welcome those who dare to be different. The interior will be a fantastical space, six impressive giant copper beer tanks will feature, the first of their kind in Scotland. The space encapsulates five separate areas, each with their own identity and story to tell. The team at Brewhemia are excited to welcome the award-winning Christopher MacDiarmid on board as Head Chef for the new operation. 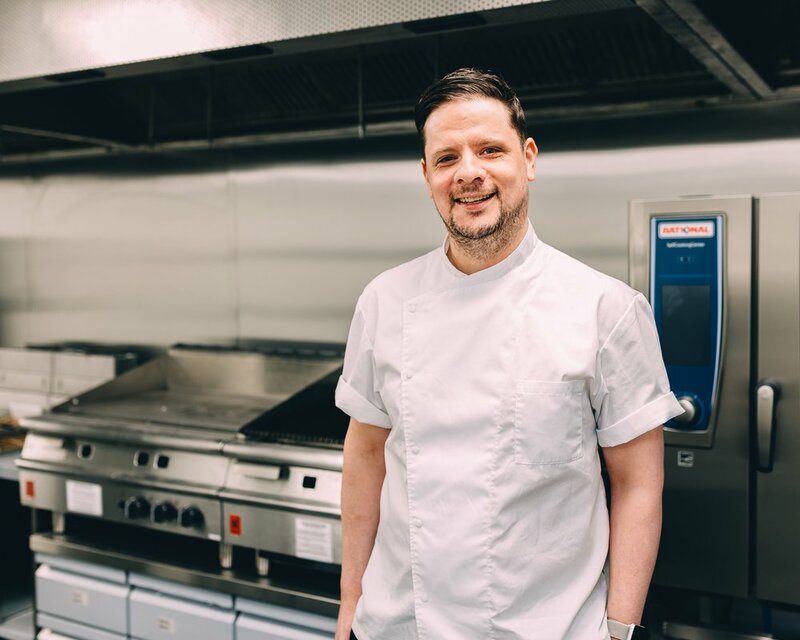 Previously the Executive Chef at Ghillie Dhu, Chris is a well-travelled and highly accomplished chef who will bring his 19 years of experience to present an exciting and innovative dining experience at Brewhemia. The opening also brings employment opportunities for over 100 people in the city centre, employees can become Brewhemians and welcome fellow Brewhemians to Edinburgh’s largest, most unique, food, drink and entertainment venue. The Ivy Collection is delighted to announce the opening of its first Scottish site in early Autumn. The Ivy on The Square will be situated in the heart of Edinburgh’s city centre, offering approachable sophistication and luxury with an underlying feeling of glamour and theatre for local residents, businesses and visitors. Open seven days a week, The Ivy on The Square will feature a vibrant restaurant space with approximately 130 seats, alongside a bar and striking mezzanine terrace in a new development overlooking Edinburgh’s historic St Andrew Square. The brasserie will offer all-day dining and an extensive cocktail list, in a relaxed yet sophisticated setting. Reflecting The Ivy Collection’s dedication to local restaurants for local diners, the restaurant will hold back a number of tables throughout the day and evening, allowing walk-ins to experience a taste of The Ivy magic in the heart of Edinburgh. The Ivy on The Square’s brasserie style menu will offer something for all kinds of occasions, serving breakfast, elevenses, weekend brunch, lunch, afternoon tea, light snacks, cocktails and dinner. The kitchen will be overseen by Executive Chef Sean Burbidge, whilst the restaurant’s affordable menus will incorporate an eclectic mix of British ingredients, comforting Ivy classics and international dishes. Dishes include the iconic shepherd’s pie and the chocolate bomb with hot salted caramel sauce. The Ivy Collection is a group of restaurants, brasseries and cafés established in London, originating with The Ivy, West Street 100 years ago, and offering accessible, all-day dining in a relaxed, local setting. General Manager, Eric Garnier is a respected and highly accomplished restauranteur from London, who has recently relocated to Edinburgh with his Scottish wife & family. Eric’s extensive restaurant industry knowledge and understanding of what makes an exceptional dining experience is sure to set The Ivy on The Square apart from the rest. There is no better way to see a city than by bus. OK, maybe hot air balloon, but otherwise for me it's the top deck of a bus. We here at SFR have been on many interesting bus trips before, there was one memorable three hour journey to get from one end of Malta to the other, a time I got sun stroke on an open top trip around Barcelona and of course our first ever review was of an open top bus around Glasgow. Now our evening experience aboard the Red Bus Bistro is right up there as one of our all time greatest omnibus odysseys. But you wonder where on earth does Hard Rock Cafe come into this…? Well in a stroke of genius the two have come up with a tantalising team-up, offering Hard Rock burgers whilst undertaking a tour of the capital, brilliant. We were treated to a sneaky peek at the Hard Rock’s World burger tour and had a sample of four of their limited edition burgers. The Tennessee BBQ Burger is actually made with Brisket and prime rib in with the beef to give the burger a deeper richer flavour. Topped off with pulled pork, zingy barbecue sauce and a creamy crisp combo of slaw and cheddar. They also showed off the Tango Salsa burger, with spicy sausage, salsa (obvs) and a fried egg which was a great if somewhat interesting combo. The Banh Mi burger is a Vietnamese inspired sensation, with a spicy glaze and topped with pickled veg and green onions, which was certainly an interesting way to top off a burger! The ole burger has a Spanish theme and the combination of roasted vegetables and Goat's cheese topping off the beef patty is a cracking mix of flavours and textures. All of these burgers are available for a limited time at Hard Rock right now. Whilst Hard Rock can celebrate over forty five years since the first Cafe opened back in 1971, the Routemaster that is now the Red Bus Bistro however had already been plying the streets of London for five years by then! This 1966 gem has been thoroughly refurbished inside and now neat tables sit between the benches allowing you to enjoy a range of refreshments whilst having a 70-90 minute tour of the capital. There is an afternoon tea tour, and a gin tour, but on a Friday evening starting from the 16th June there is the Hard Rock tour! Starting from £39.99 you can get a Hard Rock burger with fries and a soft drink as well as a chocolate brownie to sustain you during the tour, or you can upgrade to Prosecco for a few quid more. The bus will pick you up at 6pm outside the Hard Rock in George Street before touring the town. We really enjoyed our tour of Edinburgh on the Red Bus Bistro and if you want to enjoy a slightly different way to see the city then we couldn't recommend enough. Head over to their website redbusbistro.co.uk to read more details and book. We were invited along for a sneaky preview of the Red Bus Bistro and Hard Rock's World Burger Tour, but what you've read is very much our own opinion. El Toro Loco, the newest restaurant in the Greater Grassmarket to offer gourmet Mexican street food, officially opens with its launch event on Wednesday 16th September, to celebrate Mexico’s Independence Day. To mark its official opening, El Toro Loco’s launch night will feature an interactive Margarita masterclass where guests will be shown how to make varying fruit flavoured Margarita cocktails. Tickets for the event are free, which include a mini burrito on the night, drink on arrival, and food voucher to use next time they visit the restaurant. El Toro Loco, which means ‘crazy bull’, aims to offer its customers a unique dining experience with its fun, laid-back atmosphere, quirky ‘create your own’ menu consisting of burritos, tacos and quesadillas, and music that can be controlled by customers. El Toro Loco’s authentic Mexican décor includes traditional Mexican bull skulls, resin beaded human skulls, 36,000 Mexican coins (and one five pence coin!) which cover the floor, and a handmade beeswax yarn containing a story about the Huichol people in Spanish, and translated into English. Prices range from £4.50 - £6 for a main course and all food is made fresh each day, with chefs starting work at 6am. Paul Duncan, owner of El Toro Loco, says: “We are really excited about our official opening and can’t wait to celebrate with local customers on Mexico’s Independence Day. “We are bringing a celebration of all things Mexican to the Greater Grassmarket and encouraging customers to get involved, whether it’s by taking part in our Margarita masterclass, or sampling the delicious food on offer. We hope to have a full review of El Toro Loco very soon.